1. In a small saucepan, gently heat the vinegar and sugar together with 2 tbsp of water until the sugar has melted. Bring to the boil, then pour over the fennel, cucumber and radishes, and toss well with plenty of seasoning and a drizzle of olive oil. Toss through half of the reserved fennel fronds and set aside. 2. Heat the oil in a non-stick frying pan over a medium-high heat and fry the salmon fillets for 2-3 minutes each side untilgolden and just cooked. Remove from the pan and set aside. 3. Add the capers, lemon juice and crème fraîche to the pan to make a sauce. Check the seasoning, then stir through the dill. 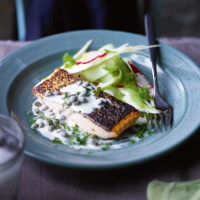 Serve the salmon fillets (save the fifth salmon fillet for lunch the next day) with the sauce spooned over and the slaw on the side. Sprinkle with the remaining reserved fennel fronds. This recipe was first published in Wed Oct 08 11:54:07 BST 2014.